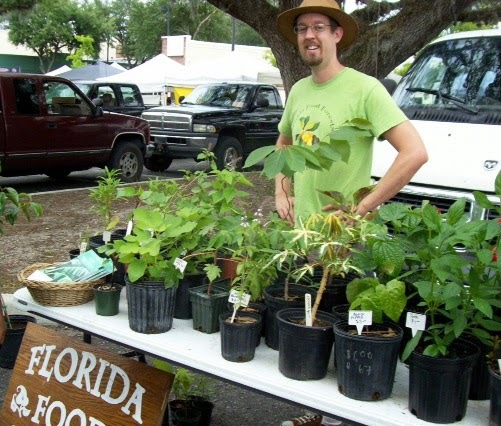 I'll be at the Gainesville Union Street Farmer's Market this evening with some cool plants in tow. I was able to get some really beautiful nitrogen-fixing "bush clover" plants, also known as lespedeza. Click here to see some specimens on Google images. They're a great perennial that works well planted beneath fruit trees and as an attractor for bees and butterflies. I've also got a BUNCH of little moringa trees for sale at $4 ea. or 3 for $10. If you don't have moringa, come pick some up. Along with those, I'll have an interesting collection of edible and useful plants including true bay, celosia, chaya, black pepper, cassava and more. Details on the market are here.